Liv ing in the Upper Connecticut River Valley, we are so fortunate to be able to take a short drive and visit a bunch of different talented artists right in their studios. 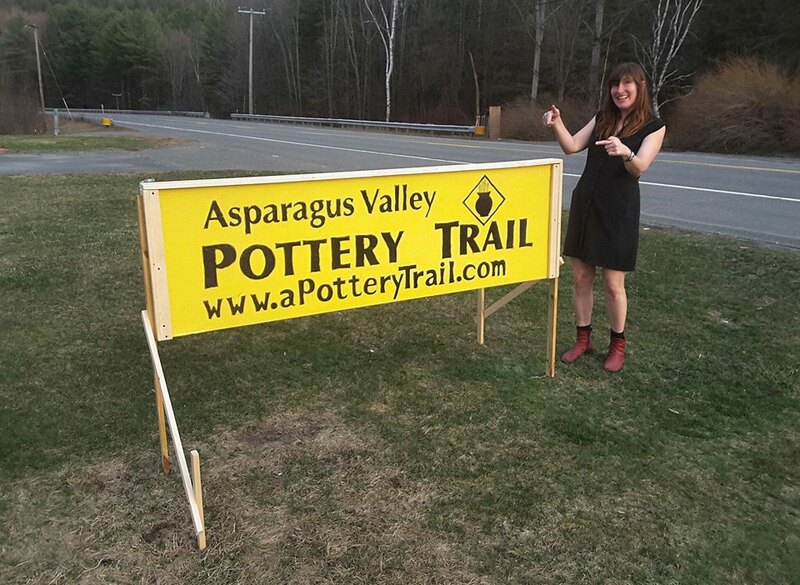 This Saturday and Sunday, you can take advantage of this when 9 local potters will open their doors to the public for the Asparagus Valley Pottery Trail. The artists will also be hosting 13 guest potters from as far away as North Carolina. From 10 am to 5 pm on Saturday, April 28 and Sunday, April 29, this free event will feature sales and demonstrations right at the artists’ studios. In the beautiful village of Shelburne Falls, two local potters are participating in the trail. Molly Cantor of Molly Cantor Pottery will have her doors open to the public and is featuring guest potter Liz Rodriguez from Rockland, MA. You can also stop by Stephen Earp’s studio and see the work of his guest, Evelyn Snyder of Florence, MA. Down the road in Greenfield, Lucy Fagella will be showing off her work along with her guest potter, Martha Grover of Bethel, MA. View the full list of participating potters here. Before you take the drive along the Pottery Trail, be sure to pick up a Trail Passport. Bring it with you to any of the participating studios and have it stamped. If you receive at least 7 stamps, you will have the chance to win a piece from one of the potters on the trail. Plan your route ahead of time using the trail map. Don’t forget to make your last stop the 2nd Annual Pottery Trail After Hours Party, Saturday 5:30-8:30 pm at Snow Farm in Williamsburg. Check out some more potter demos, a kiln opening, and enjoy food catered by Local Burgy and the Pottery Trail Ale made special for this event by Lefty’s Brewing Company. Tickets are $30 in advance and $35 at the door. For more information about all the happenings this weekend, visit the Asparagus Valley Pottery Trail website. Did you know that a staged property usually sells for more money and in less time than an unstaged property? In a recent article by House Logic, “81 Staging Tips That Helps Buyers Fall in Love,” an example of this is shown with two condo listings. Both units were in the same complex and were the same size and layout. One of the units was staged and the other was not. The staged unit sold for $30,000 more than the unstaged one. While staging your home does not guarantee you more money, putting that extra effort in before showing your home can go a long way. It is important that buyers can envision themselves living there. Remove family portraits, refrigerator decorations, and other memorabilia around the home. Instead, hang interesting artwork on the walls or set out a tea set or a board game in the living room so that buyers see what life would be like in your home. This can be a great way to start packing up the house! Clear all countertops, tables, and other surfaces, leaving only one or two decorative items such as a vase. Take away a few pieces of furniture, especially in the living room. Clean out the cupboards, leaving only one matching set of dishes and a few glasses. Clean and organize the pantry. The goal is to make the rooms feel larger and to show the full potential for storage areas such as cabinets and closets. Deep clean your entire home or hire a cleaning service to do it for you. Be sure to remove all dirt and grime from walls, backsplashes, and cabinets, especially in the kitchen and bathrooms. If you have a pet, remove all pet hair, stains, and odors. Make your home so clean it shines! Replace any old tiling or use paint instead. Fix leaky faucets or running toilets. Fill in nicks or holes in walls and add a fresh coat of paint. Replace any broken or torn window screens and any damaged or aging hardwood floors. 5. Don’t forget about the exterior! Most buyers drive by houses first before setting up showing appointments. Make sure that their first impression is a positive one. Mow the lawn, trim the shrubs and trees. Power-wash the outside of your home, driveway, and porch. Store any yard equipment or toys out of sight, but leave out something welcoming such as porch furniture or a hammock. Revive the grass with fresh sod or new seed. Brighten up the yard with colorful flowers. Then take a step back and look- make sure things look clean! Then on the day of showing, add some seasonal touches, such as sizzling cinnamon in the fall or flowers during the spring and summer. Tidy up whatever else may be lingering and then take off while potential buyers admire your beautiful, clean home. 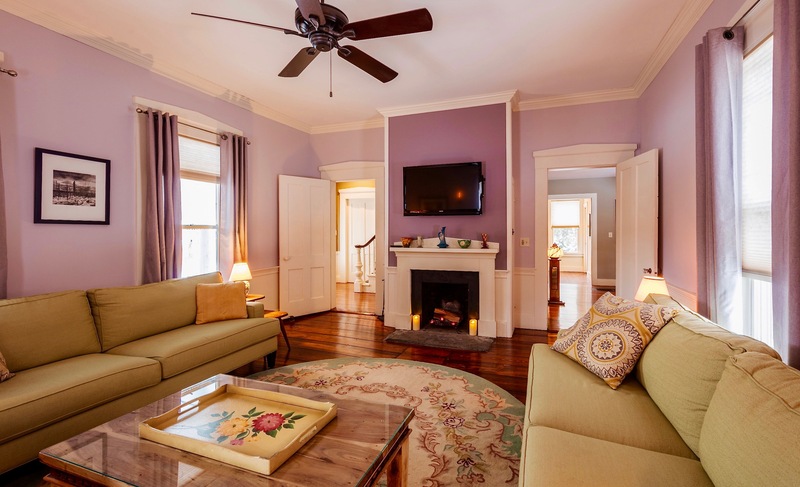 As an accredited staging professional, I have received specific training in staging homes. I work with all my clients to make sure their home is staged properly before it hits the market. Read the full article on House Logic. More tips by me for making a positive first impression. Attend the Auction, Support Your Local Businesses! As a former board member of the Greater Shelburne Falls Area Business Association (GSFABA) and a resident of the hilltowns, I love to support this association. The work they do benefits the hilltowns of West Franklin County, by boosting tourism, exposing businesses, and working together with the towns to make it a great place to live. That is why I am excited that this Saturday, April 7, GSFABA will host their 22nd Annual Auction. 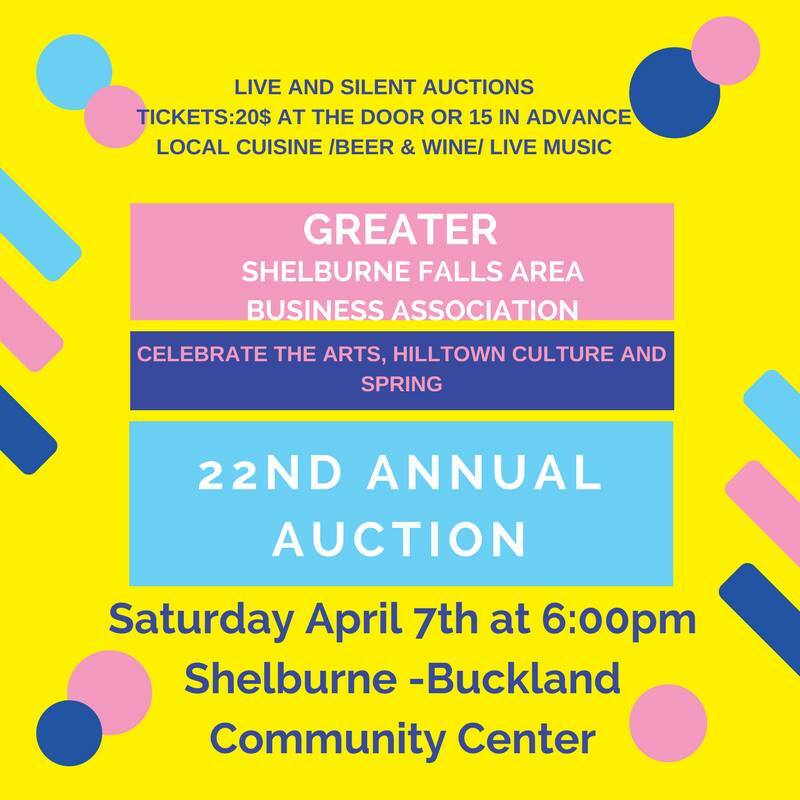 Attend the auction and bid on exciting items donated by local businesses such as getaways, glass by Josh Simpson, and bike passes to Berkshire East’s Thunder Mountain Park. There will also be a variety of local food and beverage gift baskets and restaurant gift certificates. The evening starts at 6 pm at the Shelburne-Buckland Community Center with a silent auction, followed by an exciting live auction. Plus, enjoy live music and local food, beer and wine while you bid. Tickets are $15 in advance and $20 at the door. The proceeds from the auction will go towards GSFABA’s non-profit subsidiary, West County Arts & Culture, which supports the region’s creative economy. Contact Angela Varilly at 413-775-8281 for more information or visit shelburnefalls.com. What a difference a year can make. 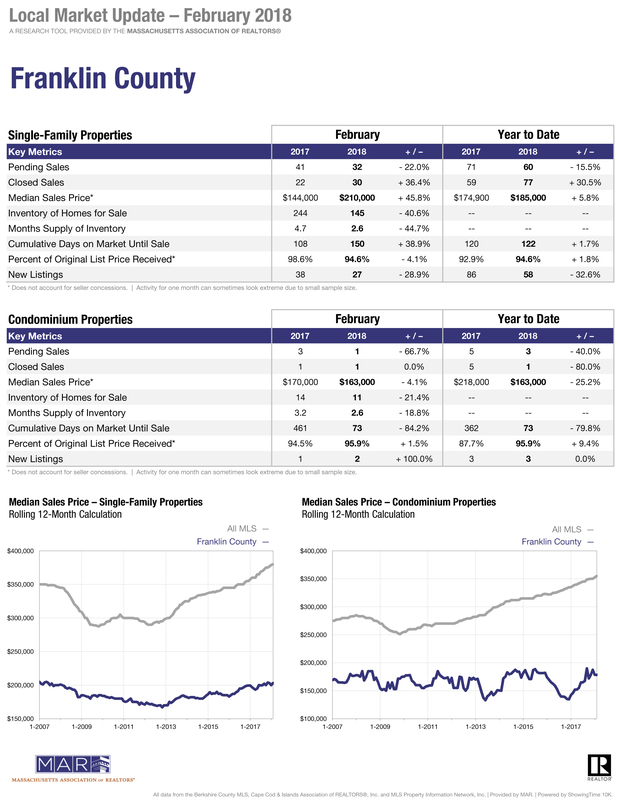 Inventory is at an all time low and average sales price is on the rise. 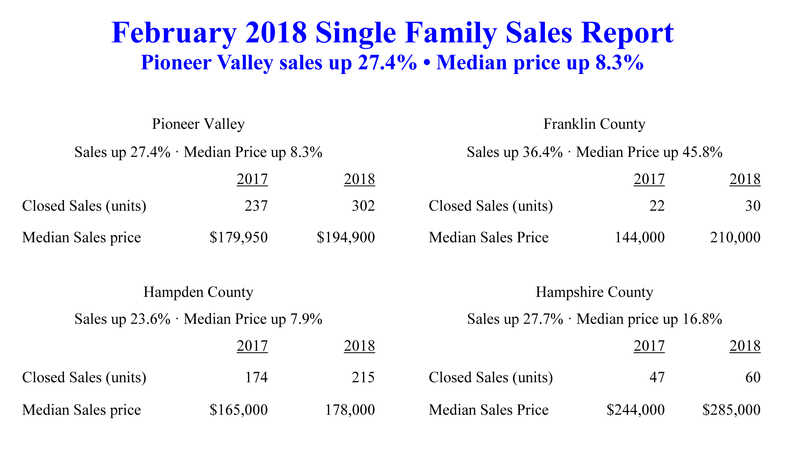 Franklin County sales were up 36.4% and the median price went up by 45.8% in February, 2018 compared to February, 2017. The sales and median price also increased in both Hampshire and Hampden County. 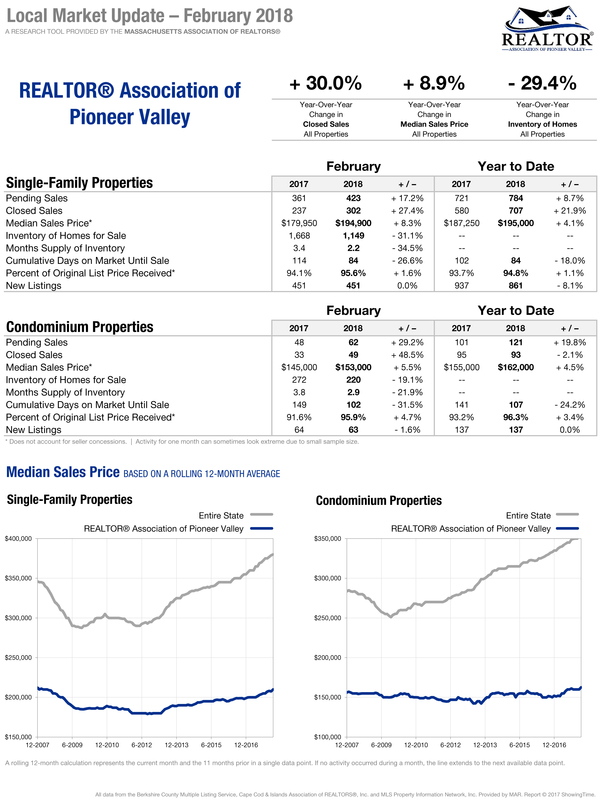 Inventory of single family homes fell in Pioneer Valley 31.1 percent from 1,668 single family listings at the end of February 2017, to 1,149 single family listings at the end of February 2018. The average days on market dropped 26.6% from 114 days in February 2017 to 84 days in February 2018. Listings which are pending (under agreement to sell) are up 17.2 percent from 361 in February 2017 to 423 in February 2018. The following reports are provided by the Realtor Association of Pioneer Valley.